A missing botanist, a giant water lily and the Russian mafia are all mixed up with murder. When botanist Stewart Halliday goes missing, his wife asks his old friend Lawrence Kingston for help. The usual inquiries yield no results until Kingston discovers that Stewart, who was supposed to be spending his time at garden-club activities, never turned up for them. Crossword clues Stewart left behind reveal that he was secretly working on an attempt to use giant water lilies to desalinate water, a project that could be worth billions. As they shoot video for a TV show on famous gardens, Kingston and his helicopter pilot are shot down, raising suspicions that someone wants to keep something on the ground hidden. Even after this warning, Kingston keeps on sleuthing, arriving just barely too late to talk to the wealthy man, shot dead, who might have been providing the large water area and money to work on the lily project. An attractive mystery woman, another wealthy investor and a Russian reputed to be an international crook are among the wild cards in a complex plot Kingston must unravel to save Stewart and himself from a sticky end. Aficionados will love the descriptions of famous plant grounds. 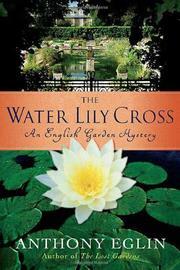 But the unlikely, ill-plotted mystery isn’t up to the standard of The Lost Gardens (2006).